The International Chamber of Commerce (ICC) is a highly respected organization in the global trading community. One of the services it provides is the International Court of Arbitration, which is an international arbitration institution with an outstanding track record in resolving cross border business disputes. The International Chamber of Commerce (ICC) is a highly respected organization in the global trading community. One of the services it provides is the International Court of Arbitration, which is an international arbitration institution with an outstanding track record in resolving cross border business disputes. Although based in Paris, it is widely made use of by companies and organizations undertaking business in the Middle East. Companies entering into business often conclude contracts which provide that in the event any disputes arise out of their agreements, they will be settled under the rules of arbitration of the ICC. The ICC Court of Arbitration is the body which administers the arbitration process. The arbitrators themselves manage and direct the arbitration and are responsible for adjudicating on the dispute. Before awards are released, they are checked by the ICC Courts for accuracy just to ensure the high standards of the ICC are upheld. All such arbitrations are conducted in accordance with the ICC arbitration rules. The current rules have been in place since 1998 but have recently been reviewed by a special task force consisting of international practitioners including Mr. Essam Al Tamimi, founder and Senior Partner of Al Tamimi & Company. The new rules have now been published and come into play with effect from 01 January 2012. The purpose of this article is to look at some of the changes being introduced. The arbitrators are now expressly required to sign a statement confirming that they will remain impartial and independent, as well as confirming they will make themselves available to take part and process the arbitrations, if appointed to the Tribunal. This is intended to minimize delays caused by arbitrators taking on too many appointments and then having no available time to deal with them. The Conduct of the Arbitration and Case Management. All clients want to see arbitrations run as efficiently as possible, because inefficiency simply adds to the time spent by lawyers, which in turn increases the charges to the clients. Under the new rules, both the tribunal and the parties are required to make every effort to conduct their arbitration in an expeditious and cost effective manner. Part of that process will be for the tribunal to convene a case management conference at a very early stage so as to ascertain what steps need to be taken to ensure the conduct of the case is streamlined and well structured. In order to avoid delays on the part of the Tribunal in issuing its award, the new rules also provide for the arbitrators to inform the parties of the date by which they expect to submit their draft award to the ICC Court for approval. This will clearly help maintain impetus as well as giving the parties precise information as to what is happening. There will be cases where parties require urgent steps to be taken even before an Arbitration Tribunal has been appointed. The ICC rules now provide for the appointment of an Emergency Arbitrator who has the power to grant various orders on an expeditious basis. This will undoubtedly be very useful, for example to prevent one of the parties from destroying evidence or acting inappropriately. Although there may be problems about enforcing such an order, the new rules envisage such relief being used in addition to ancillary applications being made to relevant courts. Orders made by the Emergency Arbitrator will not bind the Tribunal which is subsequently appointed. There may be occasions where the same parties to a dispute experience other problems arising out of number of different contracts between them. Where there is a breakdown in a relationship, it sometimes tends to escalate and spill over into other issues. In such a case, it would obviously be sensible to hear all the disputes between the same parties in one set of proceedings. Under the new rules it will now be much easier for the ICC to consolidate cases of this sort, thereby keeping the arbitration costs down. The current ICC rules allow for consolidation in certain circumstances but the new rules envisage a broader power being given to the ICC Court to consolidate. The new rules also permit the possibility of joining additional parties to an arbitration. Whilst the current rules allow for joinder by consent, the new rules empower the ICC Court to join a party to the same arbitration agreement without the consent of the other parties. The exception would be where an arbitrator has already been appointed, in which case the consent of all parties is still needed. It remains to be seen how many issues arising out of the multi-parties and multi-contract changes are referred to and dealt with by the ICC Court. Clearly the ICC cannot legislate for each and every event and sensibly they have not tried to do so. Under the current rules if one party challenges the jurisdiction of the arbitrators, for example by saying it is not a contractual party to the arbitration agreement, the matter will be referred to the ICC Court for a decision. Under the new rules, the Arbitration Tribunal itself is given the power to determine such issues unless there is some special reason why the Secretary General of the ICC chooses to refer the matter to the ICC Court. Such a change will probably speed things up and reduce costs for the parties, which is to be welcomed. Giving the arbitrators the right to determine their own jurisdiction also brings the ICC into line with a number of other international arbitration practices. Arbitrations involving claims against state or state entities are on the increase. So far as ICC arbitration claims are concerned, the new rules gives the ICC Court the power to appoint a suitable arbitrator in circumstances where one of the parties is a state or claims to be a state entity. That power will be particularly useful where a State is reluctant to take part or prevaricates in an attempt to block progress. The ICC procedures are tried and tested. The rules are highly regarded and work very well in practice. The new changes are not dramatic, but reflect the need to deal with a few practical problems which have arisen since the rules were last reviewed in 1998. In so far as the modifications reduce delays and costs, then clearly the system will have been improved. As far as the Middle East is concerned we believe the provisions will be welcomed both by practitioners and clients. The possibility of seeking emergency interim or conservative measures is likely to appeal, even though the parties may still need to involve national courts for enforcement of such orders. The delegation of certain responsibilities by the ICC Court to the Tribunal will also be widely appreciated. However, as mentioned above, the ICC Court will still retain an important role, not least to adjudicate on applications in respect of the multiple party and consolidation issues. 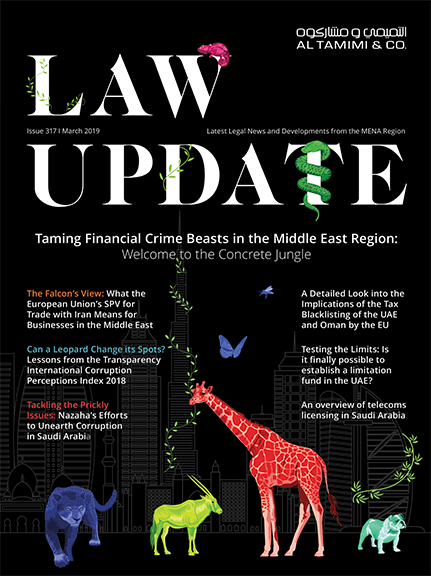 The Middle East is already very well served by arbitral institutions but the latest revisions being introduced by the ICC will increase the attractiveness of the ICC across the region.